The Volkswagen Touran arrived in 2003 with solid reviews which ensured its long-term success. 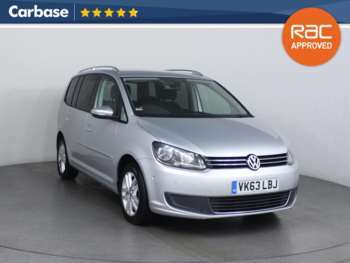 It’s built as a compact MPV, taking inspiration from other popular Volkswagen cars. Petrol engines were joined by a basic diesel in 2004 and then a 2.0-litre TDI with 168bhp in 2006. 3 years into its first generation, the Touran benefitted from a facelift, which helped to improve its position within the mini-MPV ranks. A new 1.4-litre TSI petrol vehicle was added to the range, pushing out the older 1.6 and 2.0-litre FSI models to make way for an era of efficient power. The Volkswagen Touran entered its second generation in 2010. After this, an even smaller 1.2-litre petrol engine was made available as Volkswagen sought to further enhance the frugality of this family, while new diesel units were also added. You can choose between 3 different trim setups, with both manual and auto gearboxes on offer. A used Volkswagen Touran can be bought with either 5 or 7 seats, which further adds to its practicality. If you choose the 7-seater, you can fold these seats to the floor of the car. This makes it easier to load luggage if you don't have any passengers. You can also choose to completely remove the seats if you wish. The interior is generally spacious, as it's outfitted with almost 40 different compartments. This allows you to store important bits and pieces that are necessary for your journey. It's the perfect family car that comes with bags of practicality. The diesel cars boast the most torque and power, although the newer turbocharged petrol models are also practical. A second-hand Volkswagen Touran is a comfortable, hard-wearing family vehicle with an exceptional level of quality. Popular models include the Touran S, the Touran SE and the Touran R Line. They're an extremely cost-effective car for those on a budget. Got a specific Volkswagen Touran model in mind?